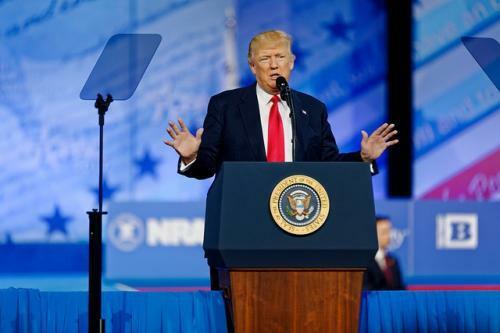 According to a flurry of reports based on anonymous White House sources, US President Donald Trump has made up his mind to withdraw the US from the Paris Agreement on Climate Change. While the White House press secretary declined to go into the decision making process, Trump, a fan of grand unveilings and big announcements, declared via Twitter late on Wednesday (May 31) that he will make his decision public on Thursday afternoon. The reports of Trump’s plans to withdraw came in thick and fast earlier this week, following the conclusion of his first foreign trip in his four-month old presidency during which the American leader failed to endorse global efforts to tackle climate change. The Paris Agreement was signed in late 2015 during the 21st Conference of Parties (COP 21) climate summit. The agreement entered into force in record time, within a year after signing, following ratification by all major emitters including the United States under Barrack Obama. In September 2016, the then President Barrack Obama ratified the agreement along with Chinese Premier Xi Jinping through an executive order. The US Republican party, then in the opposition, raised questions regarding the legality of the agreement as it had not been passed by the Senate and have claimed it to be non-binding. Despite an upbeat start to the COP 22 in 2016, signs of the treaty falling apart were visible as early as the second day of the summit when news of Trump’s election started streaming in. The newly elected leader had infamously claimed that he would tear up the Paris Agreement within 100 days of taking office. At the time, global leaders advocated a wait and watch approach while expressing confidence in the market forces and commercial interests to change the incoming American President’s stance. Now, six months later, the withdrawal seems imminent. Withdrawal from the treaty will place the US in a micro-minority of countries that are not a part of the deal. Currently, the only two UN member states that are not a part of the 195-country treaty are Nicaragua and Syria. But to place the US in the same category as the other two abstaining countries is preposterous. Historically, the US is the single largest contributor of greenhouse gases through industrial activity. According to datasets prepared by the World Resource Institute, between 1950 and 2013, the US emitted over 180 times the amount of CO2 emitted collectively by Nicaragua and Syria. According to the latest data, the US emits just under one-seventh of all the greenhouse gas emissions in the world and have one of the highest rates of per-capita emissions. This is what makes the American withdrawal from the agreement such a big setback for global action to combat climate change. Being one of the largest polluters in the world, it is crucial for the US to be a part of any smoothly functioning international treaty amidst fears of other big polluters pulling out of the treaty too. In 1992, the President George Bush Sr exclaimed emphatically during the Earth Summit in Rio, Brazil that the American Lifestyle is non-negotiable. In fact, tracking negotiations since then, that this has been an overwhelming sentiment expressed for the most part of the 20 years that a strong binding agreement was being negotiated. The first COP, held in Berlin, ended with a mandate for developed nations to set specific targets. The “Berlin Mandate” was used during the first attempt at an agreement with a wide base was made during COP 3 in Kyoto, Japan. The Kyoto Protocol, which included legally binding emissions targets for developed country Parties for the six major GHGs was adopted by consensus with more than 150 signatory nations, including the UN. But since “the American lifestyle is non-negotiable,” the Clinton administration never sought ratification from the Congress and the ‘Berlin Mandate’ was eventually defeated 95-0 in the American Senate. The mandate was seen as being “unfair to Americans” since poor and heavily populated developing countries such as India and China would be exempt from any cutbacks. The next chance for cohesive action came during the COP 13 in Bali. Parties agreed to a Bali Action Plan to negotiate GHG mitigation actions after the Kyoto Protocol was to expire in 2012. According to the Bali roadmap, the formula was simple and ethical: rich countries would cut emissions by 40 per cent below 1990 levels, by 2020, and put new money on the table. In exchange, emerging economies would join the effort, reducing emissions growth at home, enabled by finance and technology from industrialised countries. The action plan was not to the satisfaction of developed nations including the US as it did not mandate binding targets for developing countries. A two-year deadline was set for an agreement to be reached at Copenhagen during COP 15. The result was disastrous. By the time the Copenhagen Accord was agreed upon and operationalised in Cancun, Mexico in 2010 during the 16th session of the COP, the agreement had been watered down and devoid of any teeth. According to reports published on whistle-blowing website Wikileaks, American pressure was fundamental in retaining voluntary emission reductions for countries and in eliminating the possibilities of penalties in the event of non-compliance. Equity was effectively wiped out of negotiations, and finally, US and other developed nations were placed in the same box as small island nations like Nicaragua in terms of their commitments towards climate action. The Paris Agreement, while still fraught with criticism, heralded a historic step precisely due to this lengthy and fickle nature of climate negotiations. Almost the entire world finally came together and agreed on a broad plan, although details remain to be thrashed out over future COPs. But going by America’s history in these negotiations, the recent turn of events featuring Donald Trump is not even a little surprising. It is the same thing that has been pushed around since the days of Bush Sr. While Bush called it non-negotiation of the American lifestyle, Trump has branded it “America First.” In his rejection of the climate deal, Trump is rejecting the idea of a globalism- the idea that any issue can be resolved by global cooperation. Trump’s National Security Advisor, General H R McMaster, wrote in an editorial published in the Wall Street Journal that the world is not a global community but rather a global arena where countries competed with each other for an advantage. The problem that the current administration does not seem to understand is that if it wasn’t for this “competitive spirit,” it is unlikely that the world would have found itself in the position it currently does. In fact it is hard to imagine how a global issue like climate change can be envisaged to be solved without cooperation. While Trump and his band of White House enablers may claim that America first is not America alone, the fact remains that American allies and other co-signatories of the Paris Accord will hope that indeed it is the case.